Rob, may I suggest a book called Bowling Beyond the Basics written by James Freeman and Ron Hatfield. I'm currently reading it now and I've spoken to Ron about this and the book is pretty much trying to look at bowling and debunk a lot of common misconceptions with math and physics. Anyway, Ron said the ringing ten and flat ten is basically the same. It the 3 pin being pushed directly back into the 6 pin causing the 6 pin to miss the 10 pin while going into the channel. The difference between flat and ringing is how hard the 6 pin is impacted. Sometimes we just have to resort to logic, so here goes. There are 12" between the rows of pins. Therefore, regardless of the angle, the ball will always make contact with the head pin before striking the three pin. When the ball encounters the head pin, the impact will have some kind of effect on the ball. If the ball hits the head pin with maximum power, it will deflect very little into the three pin, sending it at the correct angle to send the six pin into the ten pin. If, however, the ball has lost some power before encountering the head pin, it will deflect slightly more, hitting the three pin more in the face, throwing it a little more straight back, causing the three to hit the six more on the side, sliding the six into the channel in front of the ten pin. This is why we make different adjustments for ringing tens than we do for weak tens. I knew Ron was writing this. Where is it available? It's available on Amazon both in paperback and Kindle version. I'd love to check out Ron's book. I'd also say that the Trident Abyss in the Radical video looked stronger than the Conspiracy. I was set to buy a Conspiracy to go with my arsenal but moght take a little closer look at the Motiv now as an option. Picked up the new Conspiracy tonight and really like it. Bowled 2 games with 2 other bowlers and we just bowled. Didn't worry about who was up or scores or anything. Just tried different things. 3rd game we bowled an actual game. 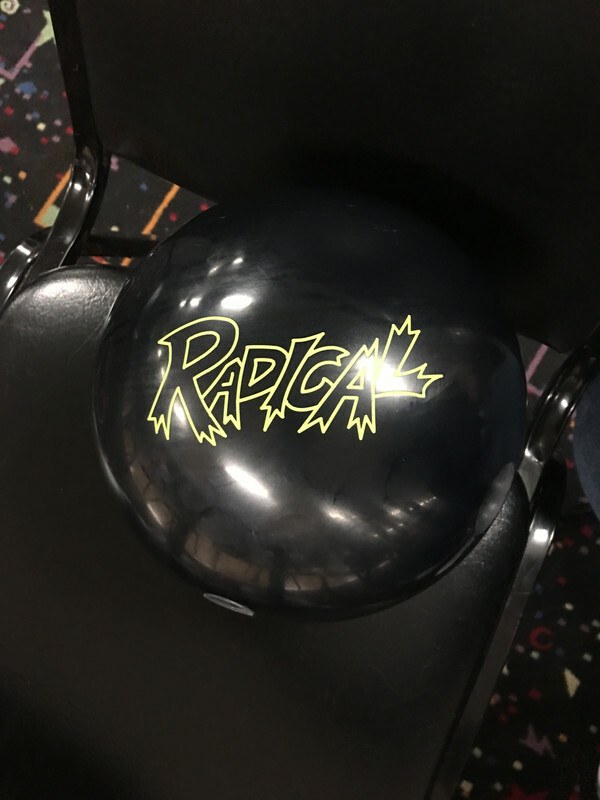 I love this new Radical but can't give all the credit to the ball. My normal release is pretty much straight up the back with no funny wrist or elbow stuff. I had tried turning my wrist slightly in to get a little more side roll. I had tried it before but was never real consistent. Worked on that tonight and also tried cupping my wrist a little. What finally got my revs up was cupping my wrist slightly with the wrist turned slightly in and also turning my shoulders a little to the outside. Normally my shoulders are square to the line but I can't cup my wrist very good like that. With my shoulders turned I can cup it. Seems like I was getting twice my normal revs and the lanes were a little dry. Stood with my right toe on about the 17-20 board (I line up my left toe and it was on the 13 board) so wherever my right toe was it was...lol. I threw over the 10 board and it went out to about the 7 board then broke into the pocket at about the 40-45' mark. And it was a pretty hard turn. Speed at the pins was about 16.5 MPH as per our sensors. Very impressed with the revs but like I said, not sure how much was the ball and how much was my release. I did talk to the PSO after I was done and he hit the ball with a 3000 before he gave it to me to get a baseline. It was definitely shinier than the new one on the shelf he had and he commented that was why he did it. He said they have been coming out of the box lately not quite as advertised so he starts with a baseline. I told him I used the CTD's on my other balls and he asked if I dry sanded. I told him I did and he said thats probably why I have been struggling. He said they should be sanded wet and they were probably burning up on me. Last edited by boatman37; 01-02-2019 at 10:24 PM. Used the Conspiracy last week in league and rolled a 227 in game 1 but the rest of the night the ball just took off with the lanes drying. I struggled to adjust and rolled 155 switched to my Kingpin in game 3 and rolled 156. Tonight used the Conspiracy all 3 games and did much better. 183, 196 and 220. Made better adjustments tonight and got better as the night went on. 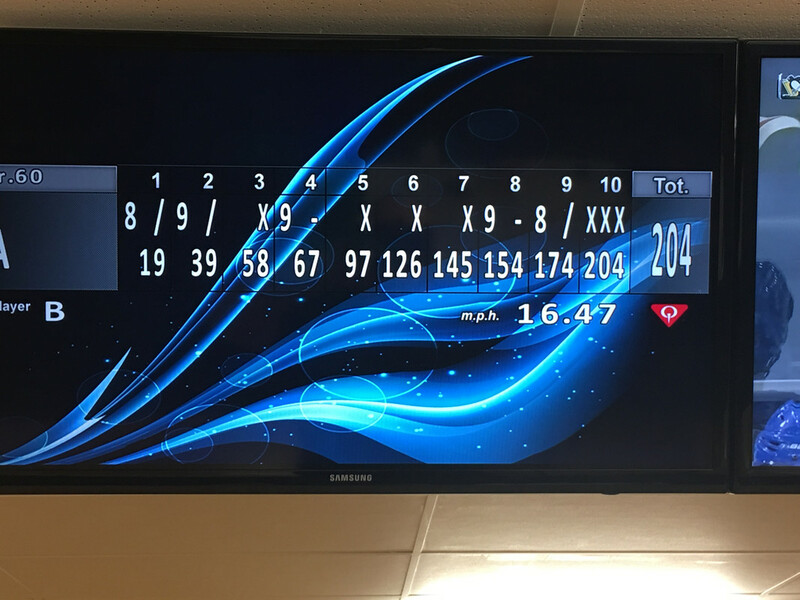 Last week when I rolled the 227 if I got near the pocket it was a strike. Tonight in game 1 hit the pocket probably about 8 frames and only got 4 strikes. Adjusted a little in game 2 and 3 and again anything near the pocket was a strike again (most of the time). So in 6 games with the Conspiracy I rolled a 204 (practice the first day out with it), 227, 155, 183, 196 and 220. 50% of those games are 200 (only have 12 200's this season out of 52 games). So my average with this ball is 197.5. My league average this season is 177. Can't say it is all ball because I did change my release right before that 204 and getting much more rotation on the ball now but still happy with this ball. Well just now updating this. Been using the Conspiracy pretty consistently and doing better...until last night. 2 weeks ago used the Conspiracy all 3 games and rolled 162, 179, and 184. Last week rolled 168, 190, and 181 with it. Last night was bad. 186, 151 and 137. The problem was the bowler, not the ball. Before last night I had been averaging about 188 with the Conspiracy but after last night I'm at about 182 with it. My running average this season is 176. Last night there were 3 Conspiracys on our pair. Myself, the PSO, and his teammate. His teammate rolled a 300 with it a few weeks ago. Last night the PSO used it in the first 2 games then switched after leaving a few 10's. He rolled a 247 and 217 with it (average is 225). His teammate used it all 3 games and rolled 258, 268, and 236 (his average is 216). FWIW the PSO switched to a white Quantam Bias and still left 10's then with a few frames left switched to a Squatch and think he threw all strikes with it. My revs are much higher now but more likely due to my new release but the ball rolls pretty straight until it hits the end of the pattern then turns hard right (targeting the 7 board at the arrows). If I move in to the 2nd arrow it still turns harder than any of my other balls but not quite as much. I don't have exact specs on my layout but it is pretty close to layout B on their drill sheet (they call that 45 x 4 1/4 x 35). The pin is just above my ring finger and the MB is about 2" from the center of my thumbhole. I have never had my specs checked so just going off the visual on their drill sheet. I like this ball better than any I have ever owned, which is a short list. I have owned an old Yellow Dot, a White Dot, a Cobalt Rhino, a Storm Sync, and the ones listed in my signature. When this ball hits the target the pins scatter. The PSO hit this ball with a brand new 3000 pad before he gave it to me to get a baseline. The one OOB he had on the shelf was quite a bit more dull than mine was but I have a baseline now. ADMINS: can you add Conspiracy to the title? Another update on the Conspiracy. Really liking this ball. Been using it pretty much every frame since I got it. Targeting the 7 board with my right toe on the 17 board (left here) the ball will pretty much ride straight down the 7 board then take a late right turn right to the pocket. And it hits hard (well my speed is also pretty high....lol). Since I got this ball I'm averaging about 15 pins higher than I had been but this is partially because of me just getting more consistent. 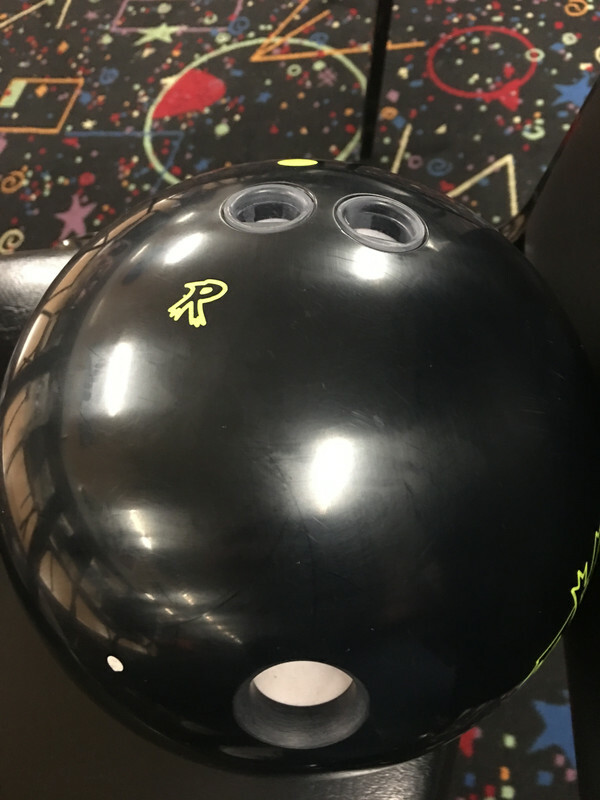 But I went out today and practiced with my Conspiracy, Kingpin, and Black Widow Gold and the Conspiracy was much more consistent and more predictable. Most of my strikes today were with this ball.